We arrived at Peitun to find that all the QJs had been taken out of traffic and replaced by new DF4s. 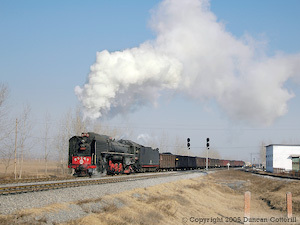 SY 2024 was the only steam locomotive remaining on the railway and was restricted to short trips between Peitun and the mines. After the previous day's disappointment at Peitun, the sight of no less than 5 clean QJs in steam at the Yanzhou coal Mining Administration's Dadongzheng stabling point was very welcome. Lined up on New Year's Day are 1981 built QJ 3538, QJ 6814 dating from 1984 and, the first of the final batch, QJ 7188 built in late 1988. The Yanzhou Coal Railway's operations are centred on Dadongzheng yard, around 5 km west of Zoucheng. On the afternoon of 1 January 2005, QJ 6814 gets a long loaded coal train rolling out of the east end of the yard towards Yanzhou. Although the landscape is fairly flat, trains are long and heavy and the locos have their work cut out on even the slightest gradients. Most trains we saw consisted of 50 C62 or C64 wagons grossing around 4200 tons when fully loaded. 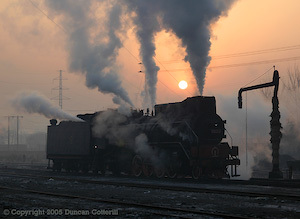 The Yongcheng Coal Railway was our great hope for steam operation but we were sadly disappointed. Two DF10D diesels had arrived a few days before our visit and now handled most of the traffic. Only two QJs were in steam, and one of them was only seen light engine. QJ 3439 did provide us with our only decent shot of the day while shunting loaded coal wagons at the south end of Yongcheng yard on 2 January 2005. More disappointment came with our visit to the Zaozhuang Coal Mining Administration's line south of Tengzhou. This was another operation where high deflector QJs had been reported but once again dieselisation had taken it's toll, leaving a requirement for only one QJ to be steamed. Luckily it was one of the high deflector machines, QJ 7068, which we found at the eastern end of the system. The loco spent much of the morning attached to the messroom by a length of hosepipe, providing steam to cook the crew's lunch. It was photographed later while doing some shunting, it's only duty that day. In addition to the large scale mining lines at Peitun, Yanzhou, Yongcheng and Zaozhuang, there are a number of smaller operations in the Xuzhou area. One of these is the power station at Jiawang, about 30 km north east of Xuzhou. On the morning of 4 December we found JS 8131 leaving the power station compound with empties for the CNR station. 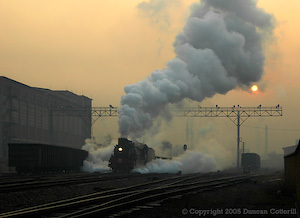 Shortly after dawn on 6 January 2005, JS 8122 was photographed at Pingdingshan shed as the sun shone weakly through the mist. 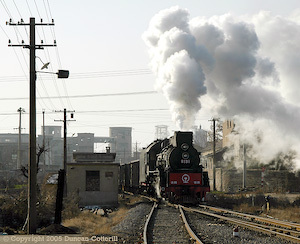 QJ 7186 is seen putting its power to good use as it accelerates from Tianzhuang yard with a train of power station hoppers bound for Mine 10 or 12 on the morning of 6 January 2005. Unusually for our time at Pingdingshan, the sun was actually out. It's a sign of desperation when you start photographing light engines but, on this occasion, I couldn't resist the patterns of light in the sky. 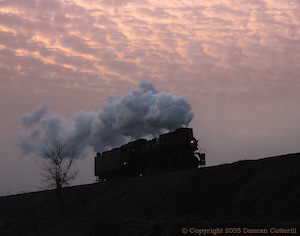 JS 6225 climbs from Shenxi towards Mine 1 at dusk on 6 January 2005. During our visit, the diesel seemed to handle most of the traffic on this steeply graded branch, leaving few opportunities to photograph steam on one of the system's best climbs. Pingdingshan was shrouded in fog on the morning of 8 January 2005, the last day of our visit. In spite of the unpromising conditions, we managed to get this atmospheric shot of JS 8057 leaving Tianzhuang with a long train of empties for Shenxi yard. This train appeared to run between 08:00 and 08:30 every morning, conveying upto 60 wagons to Shenxi where the train would be broken into shorter rakes and tripped to local mines. This was a short trip to Central China by Peter Breeze and myself. Neither of us had been to the Xuzhou area before and several of the operations reported over the past couple of years sounded interesting. We were attracted partly by the presence of high deflector QJs as well as locos from the final batch of 20 built in 1988. There were risks of course, not least from creeping dieselisation. However, the situation was far worse than we had anticipated. After meeting our guide, Sun Xiaolan, at the airport we paid a quick visit to the Railway Bookshop before going to Beijing Zhan. A new edition of the Railway Atlas is available, published in January 2004. Unlike the previous edition, which was almost pocket size, this is a big book with a price tag of 300 RMB. We left Beijing on train K107, the 20:30 to Xuzhou, a comfortable train with a smiling dragon lady looking after the soft sleepers, whatever next? It was so comfortable that I couldn’t summon up the enthusiasm to check out the train loco or the engine that had brought the empty stock in, which looked very like an NY7 from a distance. Leaving Yanzhou, a very clean QJ was in steam at the depot alongside a host of DF4s and DF8Bs, probably QJ 6936 which we saw later. Freight traffic on the Jinan – Yanzhou – Xuzhou line was worked by ND5s, either singly or in pairs, or DF4Bs or DF4Cs. The only passenger train noted was DF4D hauled although during later trips to and from Zoucheng, a mixture of DF4Ds and DF11s were seen. We stayed in the Zhonghao Hotel in downtown Xuzhou where we could see the main line south of the station, the carriage sidings and the passenger loco depot our from our 14th floor room. This line now has six DF4B in traffic according to staff at the depot. We saw four, three on shed (unidentified) and another, DF4 7722 (DL) arriving on a train of empties. There was no sign of the QJs and we were told they had been sold in mid December. Their destination is unknown. SY 2024 (JN 1993) continues in use on trips and shunts but is now the only steam loco on the line. Following the suggestion that there might be a road link between Peitun and the Zaozhuang system, we asked to go towards Tengzhou but were told that the bridge linking Peixian with Guanqiao was closed and the only practical route was via Xuzhou. The steelworks has a single loco, JS 8260 (DT 1988) for shunting the works and the associated pipeworks. It didn’t appear to particularly busy. Staff at the steelworks thought the loco may have to be replaced in the next year or so as it was difficult to find locations where overhauls could be done. The main workshops and diesel depot are in the western outskirts of Zoucheng. We found QJ 6936 (DT 1985 - ex works) and QJ 3538 (DT 1981) in steam, QJ 7189 (DT 1988) & QJ 6866 in store and QJ 3595 (DT 1982), QJ 6284 (DT 1982), QJ 6848 (DT 1985), QJ 6782 (DT 1984), QJ 7125 (DT 1986) & QJ 6933 (DT 1985) dumped. All the locos were fitted with 12 wheel tenders. Operations are centred on a large yard, thought to be called Dadongzheng about 5 km west of Zoucheng. The working locos are outstationed at a stabling and servicing point just west of the yard with coaling and watering facilities. 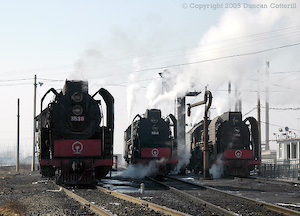 Here we saw QJ 7188 (DT 1988), QJ 3538, QJ 7191 (DT 1988), QJ 6811 (DT 1984), QJ 6814 (DT 1984) all in steam. Between 12:30 and 16:00 there were two steam departures from the yard and four steam arrivals. 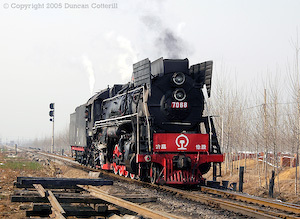 QJ 6812, 7126 (hd) and 7190 (DT 1988) were seen in addition to the locos noted above. All the QJs had 12 wheel tenders. More than half the trains we saw were hauled by DF4DD diesels. Locos noted were DF4DD 0030 (DL 2003), 0031 (DL 2003), 0038 (DL 2004), 0039 (DL 2004), 1020 (DL 2002), 1022 (DL 2002) & 1023 (DL 2002). From the west end of the yard lines diverge to the north west and south. From the east end, lines head to the north, north east and east. The line to the east has two tracks but from the pattern of workings, these appeared to be parallel single lines serving different destinations. Loaded trains were seen to depart to the north east and east from the yard. Another line where steam is in serious decline. Yongcheng has recently acquired a pair of DF10D diesels, DF10D 0051 & 0052 (both DL 2004). From their pristine appearance, they looked to have been in traffic less than a week. Two of the steam locos, QJ 3000 (DT 1983) & 3439 (DT 1980) were in use but weren’t as active as the diesels. QJ 3000 looks suspicious with 1983 builder’s plates both sides. It’s probably a 6xxx loco renumbered. All the QJs had 12 wheel tenders. QJ 3550 & 3552 (both DT 1981) were out of use but looked serviceable. We were told that a fifth loco, assumed to be the JS, was away at works. We were told here as well that it was becoming difficult to get locos overhauled. The main yard is around 2 km south of Yongcheng town and the loco depot is immediately south of the yard on the east side of the main line. Two lines leave the south end of the yard, the main line going south to the CNR interchange at Qingtan and the other south west to a power station. At the north end three lines diverge, one going west to a coal mine around 5 km distant, one going into a warehouse to the east of the railway and the third continuing north through Yongcheng town to a mine some 20 km away. The line has a passenger service, a fact previously unreported. 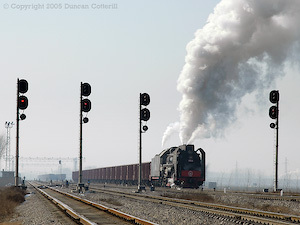 Trains run from a station in Yongcheng town, about 2 km north of the main yard, to the coal mine 20 km to the north. The afternoon train leaves Yongcheng at 15:00 and arrives back at 17:00. We were told that workings coincide with shift changes at the mine so an early morning train is distinctly possible. It was also suggested that the trains were all diesel hauled. Nobody we asked on the railway knew of the “Yongxia Mineral Company” or any other steam worked line in the area, so this operation remains a mystery. This mine railway runs 15 km west from the CNR Yanzhou-Xuzhou main line at Guanqiao to collieries in the Xigang area. It is the same system reported serving Tienchun mine south of Tengzhou by Bruce Evans in January 2004. The main loco depot is situated around 10 km west of the main line with a stabling point at Sungang, the exchange yard with CNR, located just short of the junction with the main line. At the depot were QJ 7198 (DT 1988) dumped, QJ 7199 (DT 1988) out of use but probably serviceable and QJ 6271 (DT 1982 hd) in store. Also present were DF4 7686 (DL 2003), 7706 (DL 2004) and brand new DF4 7731 (DL 2004). We were told that QJ 7069 was at Taozhuang (Zaozhuang Xi) where it was being used during the making of a film and that QJ 7197 was out of use in the compound of a closed coal mine, somewhere on the system. 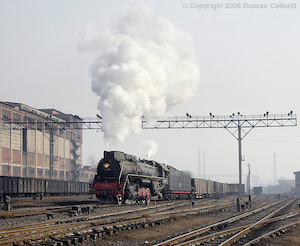 The only loco in steam, QJ 7068 (DT 1986 hd), was found shunting at Sungang. We were told that restrictions on steam locos travelling over CNR tracks was an important factor in the decision to go for diesels. A flying visit to a colliery on this system, some 20 km north-east of Xuzhou found JS 8142 (DT 1987) dumped outside the small loco shed and QJ 2132 (hd) locked inside. Nearby, DF12 0061 (2003) was stabled. This appears to be another system that has dieselised recently. Another 10 km north east of Qingshanquan, at a power station on the southern outskirts of Jiawang, we found JS 8131 (DT 1987) in steam and JS 8306 (DT 1988) cold but obviously still in service. We were fortunate to arrive just in time to photograph commendably clean JS 8131 hauling a long rake of empty coal wagons out of the power station yard. At Maocun, 12 km north of Xuzhou, three dumped QJs were lined up behind the wall of the power station. These were QJ 3596, 3597 (hd) & 7193 as reported by Bruce Evans in early 2004. Steelworks staff told us that there was a loco depot in Xuzhou where boiler washouts and other minor maintenance could be carried out. The depot was used by other locos as well as their own. We weren’t able to ascertain the whereabouts of the depot or which locations it serviced locos for. After four days at Xuzhou we’d had enough. It had been an interesting experience but it was frustrating to find almost every line now using diesels to haul the majority of trains. We had hoped to spend several more days getting some shots on one or more of the lines in the Xuzhou area but none had enough working steam to justify further visits. It was time to move on. Pingdingshan seemed the obvious place, so that’s where we went. Train K15 from Xuzhou to Zhengzhou was very busy. We didn’t have reservations and ended up standing in a hard seat coach all the way. Not a particularly pleasant way to spend the journey but at least it was only four hours. 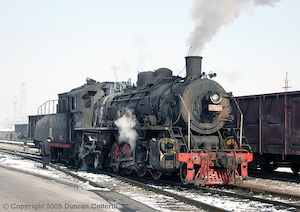 Our train was hauled by a DF11, as were many of the other passenger workings we saw. The remaining passengers had DF4Ds. Freights were almost entirely DF8B hauled except around Shangqiu where a few DF4 were also seen. The line between Xuzhou and Zhengzhou is currently being electrified with long stretches also being realigned. Delays due to the construction work added slightly to our 22 minute late departure from Xuzhou but we still arrived in time to make our connection. From Zhengzhou we continued to Pingdingshan on train K261, which was also crowded. This time we travelled all the way in the luxury of the dining car, enjoying a good meal and plenty of beer. Motive power was unknown and we didn’t notice much on the journey except a few SS4s on freight around Luohe. Our third visit to this frustrating centre. There was plenty of action but a combination of factors made it very difficult to get satisfactory photos. Cloudy periods, atmospheric pollution and a northerly wind worthy of Jingpeng Pass didn’t help. Neither did the diesel’s uncanny ability to find us wherever we went. There may only be one diesel but its nuisance value is high. The pattern of operations is virtually unchanged from previous reports so I won’t go into the details. We stayed at the Jinxiu hotel in central Pingdingshan. The most interesting discovery was QJ 7204, previously reported at Xin’an, under repair at the depot. We didn’t manage to ascertain whether it was just visiting or was now based at PDS. Of the remaining locos, the only one we expected to see but didn’t was JS 8421. JS 6429 and SY 1002 were working the passengers. The other two surviving SYs were both being overhauled. Yuzhou’s QJ 6786 was seen one day at Tianzhuang yard after visiting the depot. Another of the Yuzhou engines, QJ 6690 was out of use alongside JS 6539, newly acquired from Suixi, and dumped SY 0758. QJ 6813 was also out of use but parked in front of the depot. Apart from SY 0758, the dead locos looked to be complete and may just have been waiting for overhauls. With two SYs and a QJ in the heavy repair shop, there wasn’t room for any more engines. According to the depot management they currently have 23 active steam locos and just the one diesel. A plea to future visitors: Please behave responsibly when you visit the depot, particularly the repair shops. There was some reluctance to let us in on both occasions we visited because previous visitors had behaved in an unsafe manner. Remember, visiting these installations is a privilege, not a right and one person’s stupidity could easily spoil things for everybody else. Active Locos: JS 5644 (DT 1986! ), 6225, 6253 (DT 1983), 6429 (DT 1986), 8030, 8031 (DT 1987), 8054, 8057, 8062 (DT 1987), 8065, 8068, 8120 (DT 1987), 8122, 8338, QJ 2035 (DT 1974), 6450 (spare), 6786, 7186 (DT 1987), SY 1002, GKD3B 0003. Heavy Repair: QJ 7204, SY 1209, 1687. Pingdingshan isn’t an easy place to get sleeper reservations out of. We could have got berths on train K184 from Baofeng but it arrived in Beijing too late to be sure of getting to the airport in time. Instead we tried our luck on train 1390, a Chongqing to Beijing service. While we waited on the platform, train 2221, going to Chongqing pulled in, packed to bursting point. Fortunately our train wasn’t as crowded and we got a soft sleeper compartment without difficulty. Freight on the lines around Baofeng appeared to be solidly DF4, including some early examples such as DF4 0411 as well as many DF4Bs. Passenger trains seen had a mixture of DF4Ds and orange DF4Bs. From Luoyang, SS4s predominated on freight although a few SS1s were also seen. Passengers were hauled by SS7Ds (at least I think they were “D”s). Arrival at Beijing was ten minutes early at 05:30. A morning visit to the museum revealed no new locos in spite of a large space having been cleared some time ago. Scandinavian Airlines decided to cancel my flight home. Thank you very much! Fortunately I got to the airport before the rush started and managed to get a transfer onto Lufthansa’s midnight flight to München with a connection on to London. Ironically, Peter had been switched to Lufthansa’s Frankfurt flight a few weeks earlier when Scandinavian pulled the plug on the connecting flight to Manchester. SAS appears to be an airline to avoid at the moment. I now had eight hours to kill so it was back to the Airport Hotel to write up this report. The fact that neither the incoming LH flight nor the departure were shown on the displays at the hotel didn’t fill me with confidence. When you’ve been stitched up once, it’s difficult not to fear the worst. I needn’t have worried. The Lufthansa flight operated as planned and delivered me to München on time. What a strange flight though. We took a very indirect route, almost due west via Wulumuchi and more “istans” than I can remember, across the Caspian and the Black Sea then over Romania, Hungary and Austria. The whole purpose of this appeared to be to spin out the journey so we didn’t wake the citizens of Bayern prematurely by landing before 05:00. The result was a 12 hour flight in total darkness all the way. Boring or what? When the sun rose at around 08:00 CET the 22 hour long night was finally over. Home was finally reached a mere 14 hours late. The perfect end to a perfect trip! Using Xuzhou as a base for visiting Yongcheng, Zaozhuang and Zoucheng was not ideal. In spite of the relatively short distances involved and a first class driver, we spent between two and three hours travelling each morning and evening. That made the early and late shots we wanted almost impossible, even if there had been any trains. Local arrangements around Xuzhou were made by CITS Xuzhou, an organisation I would not recommend to anyone planning to visit the area. Among the scams they tried to pull was suggesting their local guide accompany us so she could practice her English, at a cost to us of 300RMB per day! No thank you. They also said we’d driven 1700 km when we couldn’t have covered more than 900 to 1000 km at the most. Use them at your peril. In spite of having the GKD3B for over a year, Pingdingshan still appears to have faith in steam, for the time being at least. This is one of the few organisations with full overhaul facilities. As a result, it hasn't been affected by works closures or CNR’s reluctance to transport steam locomotives to those workshops still carrying out steam repairs. The diesel seems capable of hauling heavy loads but we did notice that it was swarmed over by half a dozen staff at the depot every morning, so maybe it’s not been the success it appears. The acquisition of two JS from Suixi and the continuation of steam overhauls are certainly good news but even here, steam can’t last for ever. On a more general topic, every train we saw heading for southern or western China was packed to capacity. We were told that although the Spring Festival was still a month away, people were starting to return home for the holidays already. More people are travelling and they’re travelling earlier and staying longer every year. Intending travellers please take note. Many thanks to Peter and Xiaolan for their stoic good humour in spite of the many setbacks and frustrations. It wasn’t the best trip I’ve had but it would have been far worse with less understanding travelling companions. In spite of all the disappointments, it was an interesting and enjoyable experience. We had observed over 30 working steam locomotives and been to several operations we will be unlikely to have the opportunity to visit again. Several previously unreported locos were also discovered. Photographically, it was very disappointing with generally good light and little action in the Xuzhou area and plenty of steam but poor light around Pingdingshan. But would I go back? Yanzhou/Zoucheng might be worth another day or two but only if no more diesels arrive. This is unlikely to happen. I don’t feel any great urge to see Pingdingshan again although, if it continues to resist the pressure to dieselise, another visit is almost inevitable. Xuzhou is definitely off the agenda.